Stellar Four: This Is Jeopardy! Many people say getting to be on Jeopardy is a life long dream and our friend Simone Chavoor actually did it! We excitedly followed along on her Twitter feed as she celebrated passing the Jeopardy test, getting her call back and actually being on the show. While she was thwarted by the juggernaut that is Julia (who is on her 20th show tonight! ), Simone had an awesome time and a lot of people cheering for her. She looked damn cute up there too! Jeopardy is a family tradition in my house hold and we watch it every night. Who doesn't want to unwind after a long work day with the dulcet tones of Alex Trebek? I've always believed that Jeopardy is a game show that carries a large amount of prestige with it. It's a thinking person's game show. You have to know a fair amount of knowledge and trivia to get by. It isn't like Wheel of Fortune or the Price Is Right. You have to be pretty damn smart to get on Jeopardy. That's why it's considered such an accomplishment to even get on the show. That's why I was so thrilled when I heard Simone had been chosen. Simone was kind enough to give us an interview about what it was like to be on Jeopardy and how she prepared for her time on the show. It's a fascinating journey to even get on the show! If you've ever said "I could do that!" to your TV, this interview is definitely relevant to your interests. What was it like being on Jeopardy? Being on Jeopardy was surreal. I grew up watching the show (always on at 7, always on our ABC affiliate, always followed by Wheel of Fortune), and though you logically know that hundreds of people make the show every year, you still don't think it'll happen to you. I have always been a trivia fiend (probably obnoxiously so, to the people I played against in Trivial Pursuit or bar trivia), but even then I didn't think that meant I'd be good enough to make it to the Big Show. And on the other hand… I was still cocky enough to think I could, so I tried out! When it came time to actually be on the show, everything happened really fast, and I was so nervous that everything just became a blur. I remember the other contestants being nice but equally nervous, I remember walking through a rehearsal, I remember getting my makeup done and getting miked, I remember standing behind the podium while Johnny Gilbert announced my name… But I'm going to have to watch the show to jog my memory of more details! How did you prepare to be on TV? Did you study or try to figure out how the buzzer worked? I'll admit that I under prepared. I think I was trying not to stress myself out too much. After I got the call that told me I was going to be on the show, I let myself have a few weeks to just bask in the glow. I should have started training Rocky-style that day! But when I got myself in gear, I was watching the show every night (I'll admit that I didn't always -- at best I was a casual viewer! ), plus some of the older shows that they have on Crackle. I read Ken Jenning's book, Brainiac, and read all the online accounts of former contestants that I could. That really lit a fire under me. Some of these people trained like their lives depended on it! From that point on, I watched episodes with a clicky ball point pen as a buzzer, standing up behind the couch instead of sitting on it. I also read through the almanacs I'd bought, and spent a lot of time skimming Wikipedia. The thing about how Jeopardy questions are written is that you can actually figure out the answer (or "question," as it were) from the context. There's the category, then the clues sprinkled throughout the answer. I was pretty confident that I'd know most of the answers. It was the betting strategy that was freaking me out -- I got the call when Arthur Chu was still on-air, and such a big deal had been made of his "game theory" strategy that I focused on trying to understand how it worked. That only freaked me out more, because I am TERRIBLE at math! Especially under pressure! In the end, it turned out to be the buzzer that was the most important. Sure, I practiced with that ball-point pen in hand, and I knew you couldn't ring in until Trebek was done reading, otherwise the system would lock you out. But it's a very different story when there are two other people there trying to ring in before you. And Julia, the reigning champ, is very, VERY good on the buzzer. I actually watched her hand during rehearsal to see if I could figure out her secret. There's no secret: she's just fast! Talk us through how you got on the show! I know it starts by taking the online quiz. What happens next? I have Megan S. to thank for telling me about the online test! She let me know it was coming up -- I think they only open it up once a year. I actually tried out once before about ten years ago when I was still in college (but I didn't try out for College Jeopardy -- that was my mistake!). Back then I had to show up at the W Hotel in San Francisco and take an in-person written test with a crowd of other hopefuls. So I had never taken the online test before. And it was serious business! You have to register and wait for your scheduled test-taking time. Once it got started, the test was pretty easy. Well, not easy, but I felt very good about my performance. They don't give you a score or anything, but I knew I had done well. And after that… nothing! Just, "Thanks for taking the test! We'll contact you if you've made it to the next stage." A little anti-climactic, but it was kind of fun. About three months later I got an email asking me to come to an in-person audition that would include a combination of a written test and mock game. At first they wanted me to come to LA for the audition (which would have been fine with me! ), but then they added a Sacramento date, which was much closer to me here in the Bay Area. My family was really excited for me, and they treated me to a hotel room so that I didn't have to stress myself out getting there. It ended up being necessary because the audition started at 8:00 a.m., and I am NOT a morning person! Even worse, I was incredibly, incredibly sick. I had a bronchial infection or something; I could not stop coughing, I barely had a voice, it was hard to breathe… I was a hot mess. But I made it to the audition in one piece. It was held in a hotel conference room; there were about 15 people there total. Even though I know they go through multiple cities for live auditions, I was encouraged to see that I was in a smaller pool of potential contestants. There were three contestant coordinators there who took us through the process. We had two written tests, then we were called up to the front of the room in groups of three to participate in a mock game. They had buzzers and a video screen with the Jeopardy game board and everything. I tried really, really hard to sound not-sick but I knew I wasn't fooling anyone! They also had us run through the "contestant stories" we'd submitted earlier. I knew that at this point in the process, most people could answer the questions correctly. What they were looking for was someone who had a modicum of screen presence. I guess in the end they were able to see past my near deathbed status. After the audition, I didn't hear from them for a year. They tell you you're put into a pool of potential contestants for 18 months, so I knew it could be a long wait. But after a year, I kind of let it go -- and that's when they called me. What was it like to meet Alex Trebek? I actually barely met him. They're very serious about keeping themselves above even the appearance of impropriety. TV quiz shows have suffered from cheating scandals before, so they keep the contestants completely separated from anyone who might know the answers to the questions -- and that includes Trebek, of course. I didn't lay eyes on him until just before we started the game. He asked us how to pronounce our names, took pictures with us, and then the game started. The only time I really got to talk to him was when we were standing in the middle of the set as the final credit rolled. You know, everyone stands around chatting while the credit scroll over at the end of the show? 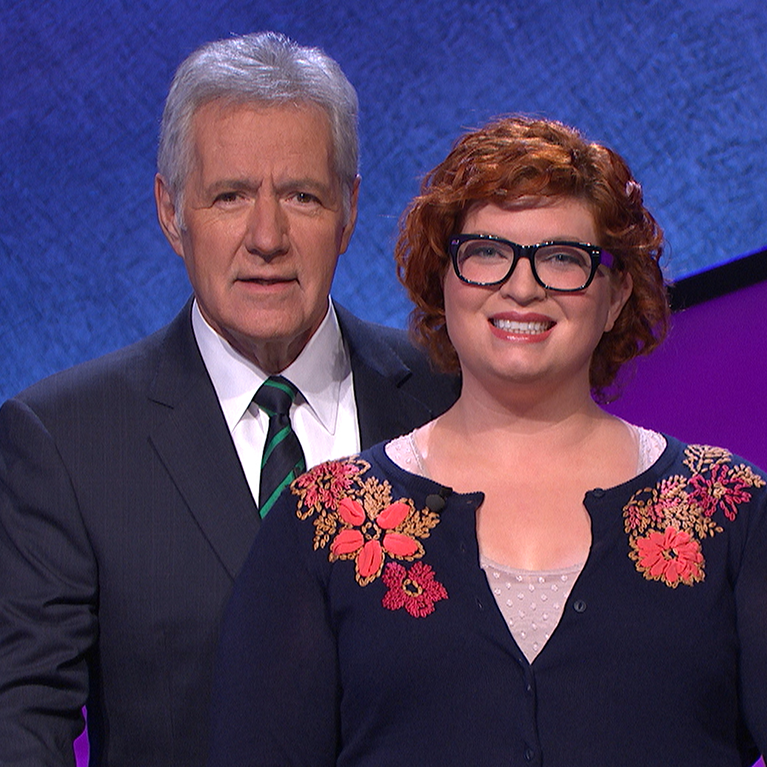 We were all complimenting Julia on her performance, and Trebek said he knew it was tough for me and the other contestant, Steve, to go against her. I said that I was happy to have been beaten by the best, and Trebek touched my arm and told me that was a good attitude to have. The entire exchange is completely hilarious to me now. Alex Trebek touched my elbow and told me I had a good attitude! It could not have been real. Do you think you'd do anything differently on the show? Well, I would have trained harder on the actual game-show aspects of playing. Figuring out how to hold the buzzer, how to click it faster, how to time ringing in to when Trebek stops reading. But then, without having access to a real buzzer and podium and all that, how could I? I guess the only concrete things I would have done differently are that I should have rung in even if I only thought I MIGHT know the answer, and I would have bet more when I got a Daily Double. Ken Jennings wrote an article for Slate where he discussed this very topic, and he was right. You're more likely to get a Daily Double correct than the Final Jeopardy question, so that's the time to bet more money. I did get that Daily Double right, and immediately afterward I kicked myself for not making it a "true Daily Double."